Did you know Manchester City and England striker Raheem Sterling has not scored for England in 1000 days? It’s a fact Matt ‘Statto’ Lawton wants to share with his Daily Mail readers. Sterling could have scored last night as England defeated Colombia on penalties to progress to the World Cup quarter-final but he was “hooked” off after 88 minutes. 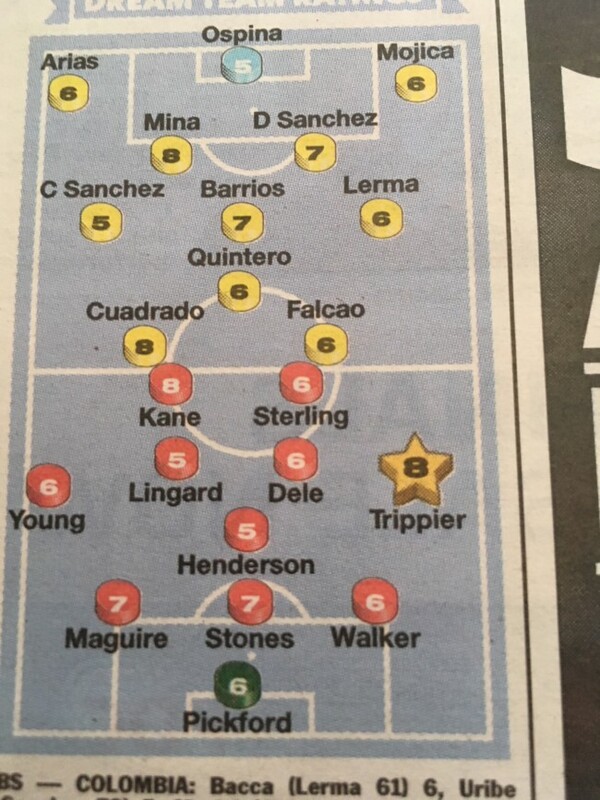 Sterling was replaced by Jamie Vardy, who in the Mail’s all-important “Jamie Redknapp’s Big Match Ratings” scores 6.5 – the same as Sterling gets. 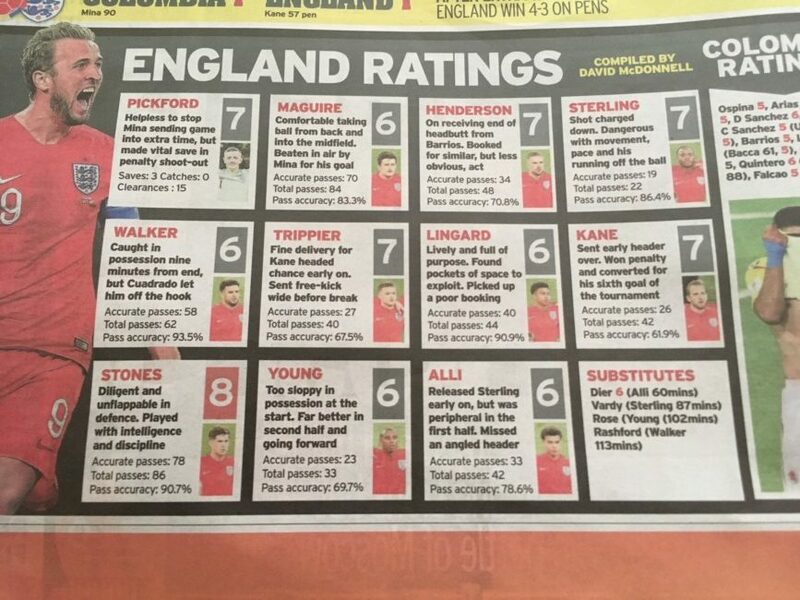 Sterling was not the worst England player on the pitch according to Redknob. He scored higher than Kyle Walker (6), Deli Alli (6) and Ashley Young (6). But why does Sterling feel the hatchet between his shoulder blades and the rest do not? And what of Eric Dier’s scoring a 7? He had a “pass completion rate of less than 25 per cent in his first 24 minutes on the pitch” (source: Martin Samuel, Daily Mail) and was “ordinary” against Belgium. He did score in the penalty shoot-out, a shot that was a “bit scuffed and [David] Ospina got a hand to it”. But there he is on the Mail’s back page “The Coolest Man in Moscow”. He was cool? No. In the Mirror, Dier says he was “nervous”. Andy Dunn says “Sterling at least remains one who can dash past a defender, take a risk, create splash of chaos”, factors described as “rarities” in a game big on “chaos”. The Mirror gives Sterling a 7 – the same as Pickford, Trippier, Henderson and Kane. Only John Stones with 8 scores higher. Sterling was “dangerous”. 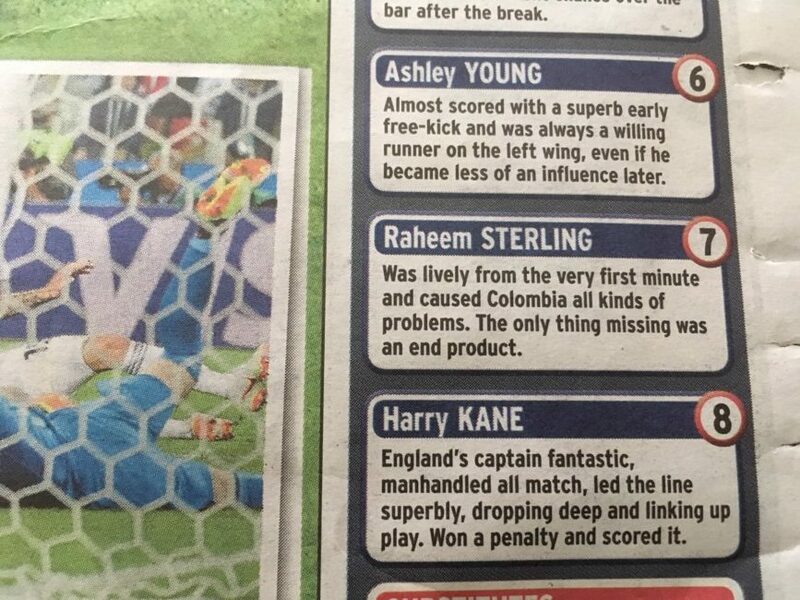 Over in the Sun, Sterling gets a 6. That’s a higher mark than Lingard and Henderson, and the same as Pickford, Walker, Young and Dele. 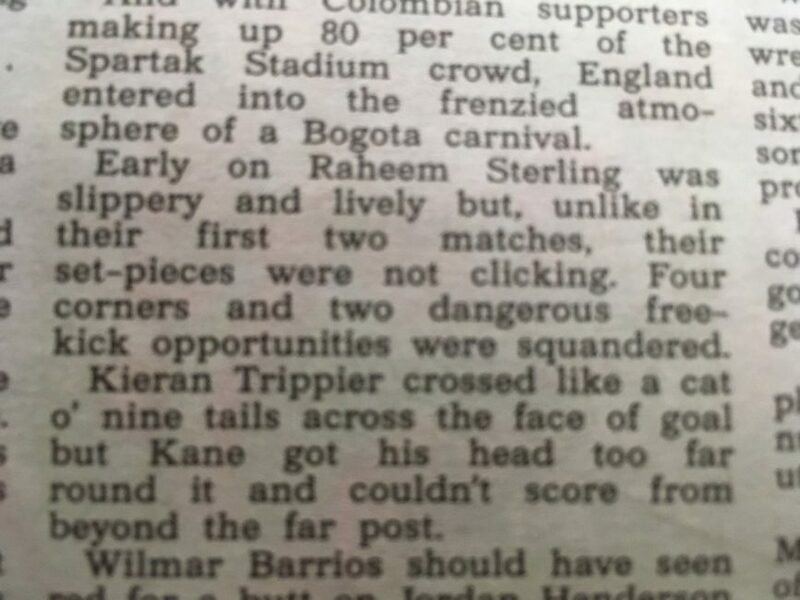 The Sun says Sterling was “slippery and lively” and “darting”. 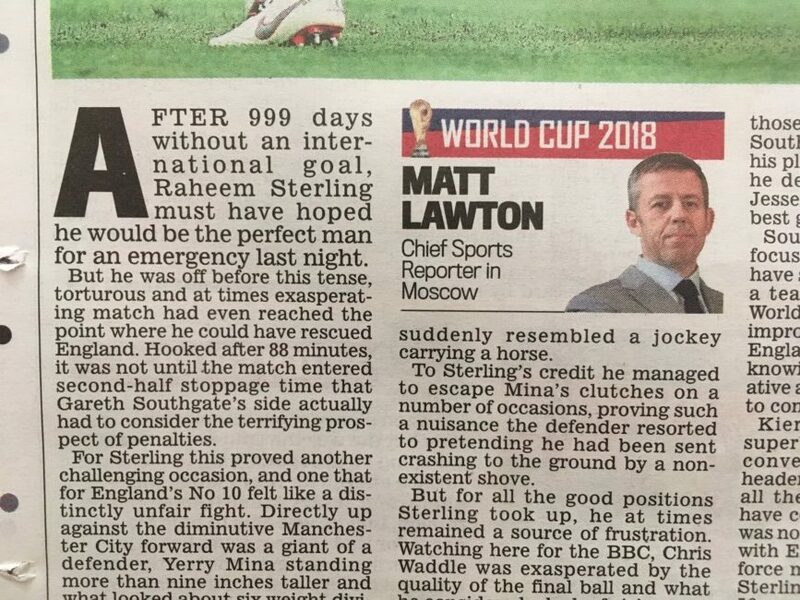 In the Express, “lively” Sterling who “caused Colombia all kinds of problems” scores a 7 – that’s more than Pickford, Stones, Maguire, Henderson, Dele and Young. Only Harry Kane (8) scores higher. So why is Sterling derided in the Mail? Has the Mail got a problem with Sterling? It’s been while since Sterling scored in an England shirt, his last goal coming on 9th October 2015. But only Sterling gets compared to a “mascot” and a “jockey” in the Mail. No other player is so diminished.